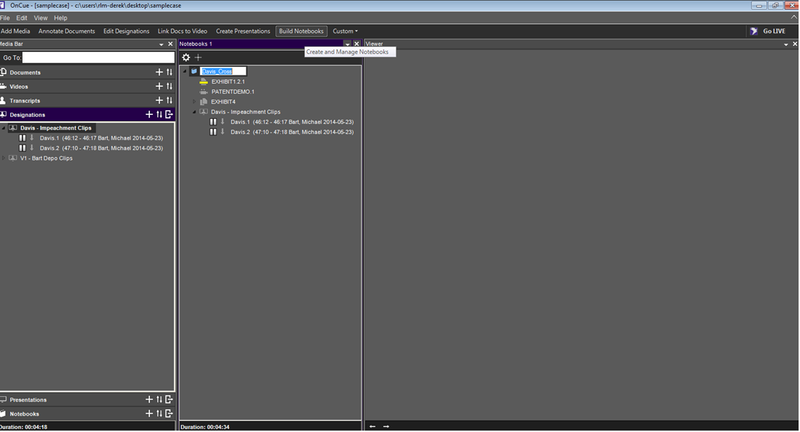 To access OnCue’s pre-set screen layout for Notebooks, click on the “Build Notebooks” tab in the Workflow Ribbon. This screen layout provides a Notebook Pane to the right of the Media Bar so you can easily navigate between your Notebook and all the other media you have registered in your Case. To add a new notebook, click on the + sign in the Notebooks pane, then name the Notebook however you like. You can add any item in your database to a Notebook - - whole exhibit folders, single pages, treated pages, video or audio clips, designation lists, or even individual designations. Populate you Notebook by dragging items from the Media Bar into the Notebook. It’s that easy! You can also copy and paste items into a Notebook by selecting the items, right-clicking and selecting "Copy" from the drop-down menu. You can re-order the items in your Notebook by dragging and dropping within the list.